Joy Global has released their third quarter results for this year, signalling a plummet in sales compared to 2015. The company’s net sales fell 26 per cent to $587 million from last year’s $792 million, with their funds from operations down $90 million to $26 million. Net sales in the third quarter of 2014 were $857 million. The results showed capital expenditure was down $7 million to $11 million in the third quarter. It also revealed a 41 per cent decrease in original equipment sales and a 21 per cent decrease in service sales compared to last year. 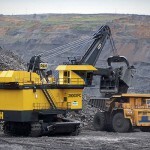 The slump was felt across both underground and surface mining machinery sales; dropping 30 per cent and 21 per cent respectively. Service sales for underground mining machinery dropped 25 per cent, with the most significant reduction in the US coal market, which was down $42 million (40 per cent) year on year. Original equipment sales for surface mining equipment decreased 31 percent compared to the year before, with an increase in Australia more than offset by declines in all other regions. Additionally, bookings for underground mining machinery decreased 21 per cent and surface mining equipment decreasing 24 per cent compared to the same quarter last year. The company attributed this year’s loss to lower sales volumes, unfavorable product mix, lower manufacturing absorption as well as restructuring charges and merger costs. 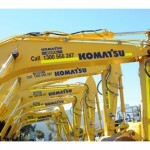 Two months ago, Komatsu announced the acquisition of Joy Global for US$3.7 billion. This was part of its three-year growth strategy with focus on strengthening their core mining equipment business. The acquisition will also provide a new line of surface equipment for the Japanese firm. 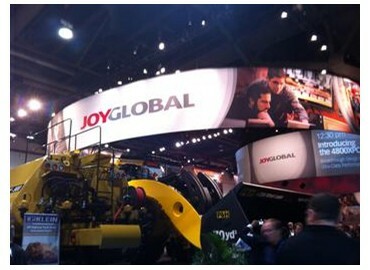 Joy also revealed a negative impact of $27 million from restructuring charges compared to $11 million the year before. Restructuring mainly occurred in North America and China, with the company having to pay severance and termination fees as they continue to cut down on their staff numbers and enhance their global manufacturing footprint. On a more positive note, the company’s focus on safety in the mining industry has had better results, with a number of their facilities having no incidents over the last year. “Over the last 12 months, we’ve had 15 manufacturing and service facilities that have achieved zero recordable incidents over that period,” Doheny said. “It’s a great achievement for our company and a core focus for us as we continue to see our facility footprint change around the world.